158", 169", 193", 217", 236", 254", 276"
Meritor: 15,500 - 23,000 lbs. Dana Spicer: 15,500 - 23,000 lbs. Meritor: 8,000 - 10,000 lbs. Dana Spicer: 8,000 - 10,000 lbs. Navistar Select: 8,000 - 10,000 lbs. International® Vari-Rate Spring: 13,500 – 21,000 lbs. International Ride-Optimized Suspension (IROS Air): 15,500 – 23,000 lbs. The CE Series, from IC Bus and Maxim Truck & Trailer, carries up to 77 students. It is also equipped with the latest in safety innovations and technology, including the Leave No Student Behind® safety system that comes standard on every bus in the CE Series. 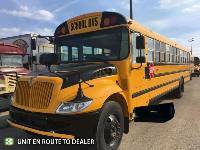 IC Bus's goal was to build a school bus that would not only provide the utmost protection for students, but get high marks from the people who buy, use and maintain it. So they built an IC Bus™ integrated chassis, with all-steel cage construction, 16-gauge steel side sheets and 18,500-lb. rear steel-spring suspension. And powered it with the proven, dependable MaxxForce® engine with MaxxForce Advanced EGR, the only no-hassle solution for handling EPA emissions requirements. If you need a bus that’s safe, strong, and powerful, we’ve got you covered. A school bus’s primary goal is safeguarding children at every stop. So IC Bus placed lighted controls for the entrance door, warning lights and other high-use items on the steering wheel. They increased the height and width of the entrance door to keep students more visible. And to make sure the bus is completely empty at the end of the day, they made their Leave No Student Behind® safety system standard equipment. It’s a combination of safety features the competition simply can’t match. For mechanics, maintenance is made easy with a lightweight Easy Tilt hood, coordinated service intervals, and a self-diagnosing Diamond Logic electrical system. As with all of their buses, IC Bus has you covered throughout the entire ownership experience with their complete bus diagnostic checkup computer system, an expansive parts distribution system and an unmatched dealer network for 24/7 support.